Modernism celebrations and conferences are becoming more numerous. After such an event gains a certain amount of local awareness, the challenge for organizers is to make it continue to appeal to a range of interested parties, from docents in Pucci dresses to scholars in button-down shirts. How do you avoid devolving into a love of style over substance? How do you keep bringing back the style groupies, the design professionals, and the scholars? SarasotaMOD Weekend, an annual midcentury modern architecture festival in Sarasota, Florida, just held its fifth program this November and made a convincing case that it is taking the challenge seriously. 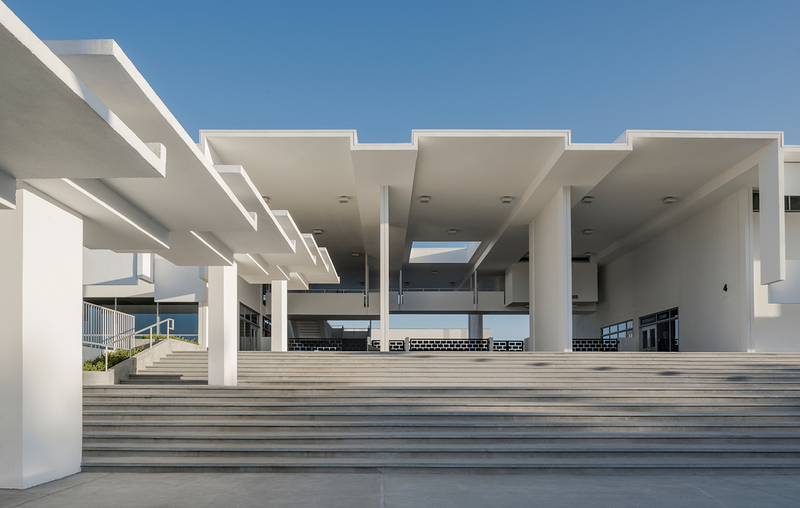 Presented by the Sarasota Architectural Foundation, SarasotaMOD has twice centered the festival around Paul Rudolph, commonly referred to as the father of the Sarasota School of Architecture. In recent years, the festival has had programs on other architects who followed in his wake, including Victor Lundy and Tim Seibert. Given that 2018 is Rudolph’s centenary, it made sense to celebrate the legend once more. This year, high-priced trolley tours of Rudolph’s built legacy sold out. They offered opportunities to see some buildings that are rarely open to the public. But it was the thoughtful morning presentations, entitled “Paul Rudolph Legacy Morning,” that suggested a way forward for this and other modernism conferences, like those in Palm Springs, Tucson, and Columbus, Indiana. These morning presentations included a documentary from 1983, entitled Spaces: The Architecture of Paul Rudolph, which offered rare footage of Rudolph being interviewed and throwing a fit over the shape of the altar design at Emory University’s Cannon Chapel. Made before Rudolph fell out of national favor, the film gave everybody the same starting place for understanding Rudolph. This was an excellent segue to “Reassessing Rudolph,” a panel discussion. Rudolph scholar Timothy Rohan, the moderator, asked the panelists—architect Joseph King, coauthor of Paul Rudolph: The Florida Houses, and Rudolph scholars Brian Goldstein and Ken Oshima—about Rudolph and his place in modernist history. In his comments, King pointed out that at first glance, many Rudolph buildings suggested a singular idea, but once you enter the buildings, the variety of interlocking spaces reveals itself. Rohan described Rudolph’s innovative use of perspective sections and how these and other dramatic drawings made Rudolph’s reputation. Interestingly, other architects who veered from strict corporate modernism, folks like Saarinen, Stone, and Kahn, were not postmodernists per se, but were the harbingers of change. While Rudolph’s high-rises in Asia were not pure modernist, neither were they historicist. Rudolph’s reputation suffered after the 1969 fire at the Yale Art and Architecture building, but he persevered. And his legacy continues to be debated. Unlike other architects associated with modernism or Brutalism, he did not champion an orthodoxy. He relied on intuition and emotion. In that way, he reminds me of Bruce Goff without the whimsy. One important point raised during the conversation was that Rudolph was an example of the failure of joining modernism and urbanism. He is in good company there. The big draw for the morning was Pulitzer Prize–winning architecture writer Paul Goldberger. Goldberger gave a lively lecture that would appeal to the Rudolph novice or scholar. He fills the bill for this kind of meeting. He has enough depth on the subject to bring together unlikely strands, but he can relate those strands back to popular culture. For example, he talked about Rudolph’s ability to combine high and low culture, especially in his interiors projects. Early in his presentation, Goldberger said that Rudolph was “a difficult architect…not easy to like.” This notion contrasts with the sweet and often modest early houses he designed around Sarasota. Both the scholarly panel and Goldberger were able to link the early work to the larger and less sweet later work. In the Burkhardt House of 1957, many of the conference attendees were able to see up close the complexity and intriguing circulation that Rudolph was playing with in his early work. At a cocktail reception and subsequent tour, the Burkhardt House’s current owners told stories about meeting Rudolph after they bought it. He was relieved that they were removing an unsympathetic kidney-shaped pool that an earlier owner had added. However, Rudolph was not pleased that the owners were installing a rectangular pool more in keeping with his architecture. Apparently he suggested they just use the local YMCA instead. The current owners were clear about who owns the house, often a struggle with a unique architectural talent like Rudolph. At the end of the question and answer session, Goldberger responded to a question about what to look for on the tours by suggesting that people look at the beauty of the architecture and the banality of the strip we would all travel to get there. This is an issue that is especially relevant because of Rudolph’s deep interest in and failure with urbanism. The festival’s program cover features an illustration of the Cocoon House drawn by local graphic artist John Pirman. Rudolph’s modest rectangles on or near the water lend themselves to beautiful renderings and postcards. These houses are easy to love, especially in Ezra Stoller’s beautiful photos and Pirman’s other recent prints, but what about the urbanistic implications of his larger buildings, often made with ribbed concrete, or of his tree-like towers in Asia? The success of the conference was that these kinds of questions were raised, if not wholly answered. Next year’s focus for SarasotaMOD has not been decided. Christopher S. Wilson, the Sarasota Architectural Foundation’s chairman of the board and a professor at Ringling College of Art and Design, suggested it may focus on Carl Abbott, a living architect of the Sarasota School. If the festival can keep the balance of informed lectures, lively discussions, and tours, it will be worth returning to learn more about this slice of Florida. April 9, 2018 Isn’t Brutalist architecture worthy of preservation?